I’ve always loved pumpkins. We didn’t see many pumpkins as a child, marrows yes, pumpkins no. American soaps and sit coms were in full flow during my late teenage years often with the story line of family’s sharing pumpkin pie and I would peer at the small television screen very carefully to see if I could see what was being eaten. 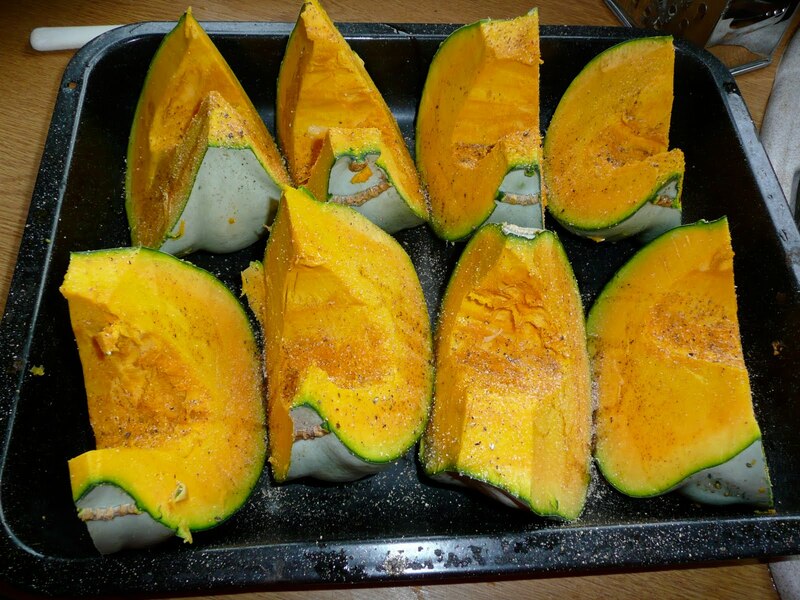 Strangely I still haven’t made a pumpkin pie I think mainly because my taste buds much prefer a savoury dish. I’ve made handmade ravioli with pumpkin and a sage and butter sauce which were delicious, there have been butternut squash risottos, pumpkin mash with and without cheese, various soups, chunks of roasted pumpkin with roasts, but no pie. During the last couple of years we have been trying various varieties. Although some of the varieties were interesting last year I felt that there was something still missing. 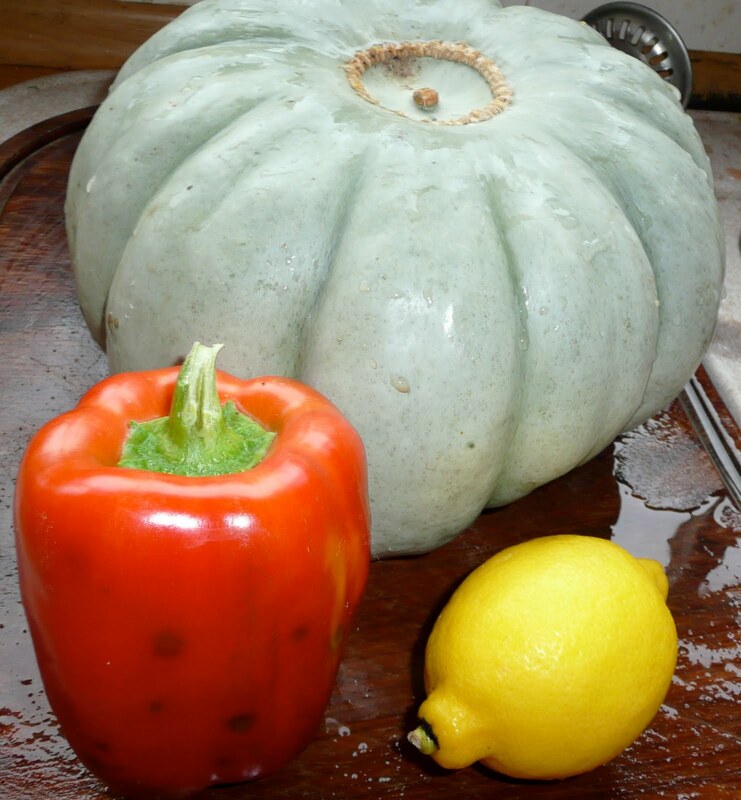 That we hadn’t reached the heady heights of the most flavourful pumpkin. So with a little research we have a couple of different varieties in the ground one of which is Crown Prince. Isn’t it pretty. I love the mark where the flower would have been. And I must show you this, I am very proud. We tried a new variety of pepper this year. (I’ll need to look in my seed catalogue to identify it) What a whopper, I’ve placed an average sized lemon next to it to give you some perspective. I then gave son no.2 a lesson in how to cut up a chicken into eight pieces, as cooks we know that a whole chicken is much cheaper to buy than the equivalent pieces of the bird, and eventually one will tire of plain roasted chicken, where pieces can take you to all sorts of recipes. Tonight we just cut up a lemon and with that scattered garlic cloves in their skin, salt, pepper and thyme, gave it a good stir around with our hands, covered it with foil and popped it in the oven on a low light. Just a quick aside, Son no.2 is doing extremely well in his cooking, he can knock up many savoury dishes now, bolognese, chilli’s, curry’s, pasta sauces, cottage pie, fajitas, chow mien etc and he understands the basics of soup from homemade stock and how to make a salad dressing. Although he hasn’t mastered pastries and cakes, (although he does make very good pancakes), and hasn’t done a roast from start to finish and has yet to master a roux sauce, he won’t starve. I’ve just dribbled some olive oil over them, lightly scattered them with salt and pepper and then grated nutmeg over them. I love the warm notes of nutmeg with pumpkin. A little something for a lovely friend. Your pumpkin is lovely but I have never seen a pumpkin before that wasn't….well…pumpkin coloured!! !I didn't know they came in colours other than orange!!! I'm feeling hungry just reading this. The pumpkin looks wonderful. 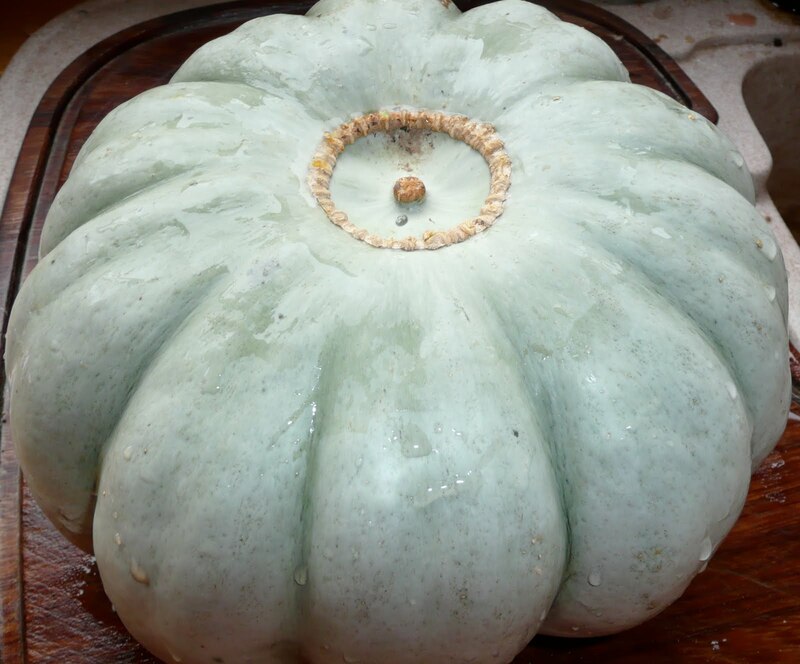 Pumpkin is looking good, I've grown Queensland Blue for the last two years and had a good crop. Nice nutty taste.